A basic requirement for computational fluid dynamics (CFD) is to have a discretization of space into small elements in which fluid properties such as density, pressure and velocity can be uniquely assigned to each element. There are a variety of ways to subdivide space and some of the more common ones are briefly described in the article Grid Systems, which offers a few pros and cons for each possibility. Rectangular grid elements are probably the simplest to generate and use for numerical approximation, but are often seen as too restricted for general use. The article Rectangular Grids shows the fallacy of this by explaining how rectangular grids can be easily extended in several ways to offer more complex gridding possibilities. Application of CFD to real problems often requires more than a straightforward numerical model of the basic fluid equations for conservation of mass, momentum and energy. Several of these issues are discussed in the remaining articles under the heading of General CFD. 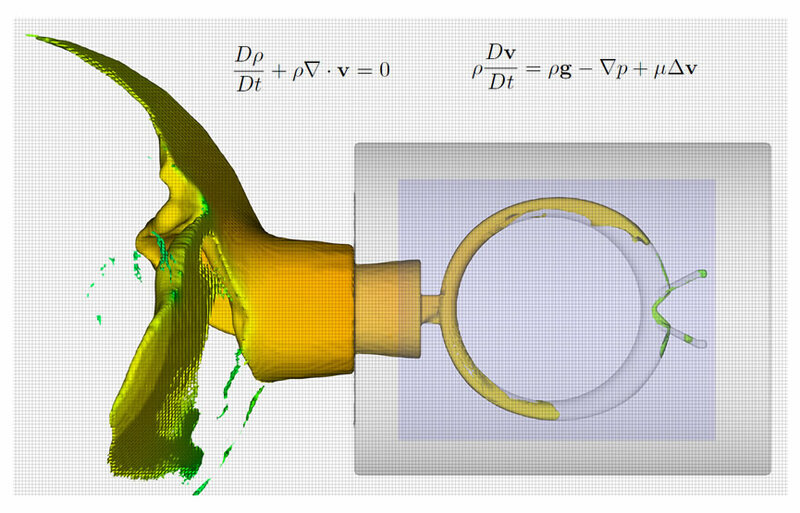 A short summary is given of different ways to numerically model free fluid surfaces or fluid interfaces. Another of the articles discusses approaches for modeling turbulence phenomena, and finally, there is a general discussion of the use of discrete mass (or marker) particles. Intuitively, discrete particles would seem to be ideal for tracking the evolution of complex fluid flow, however, as this last article explains, there are a number of limitations associated with discrete particles that should be kept in mind.